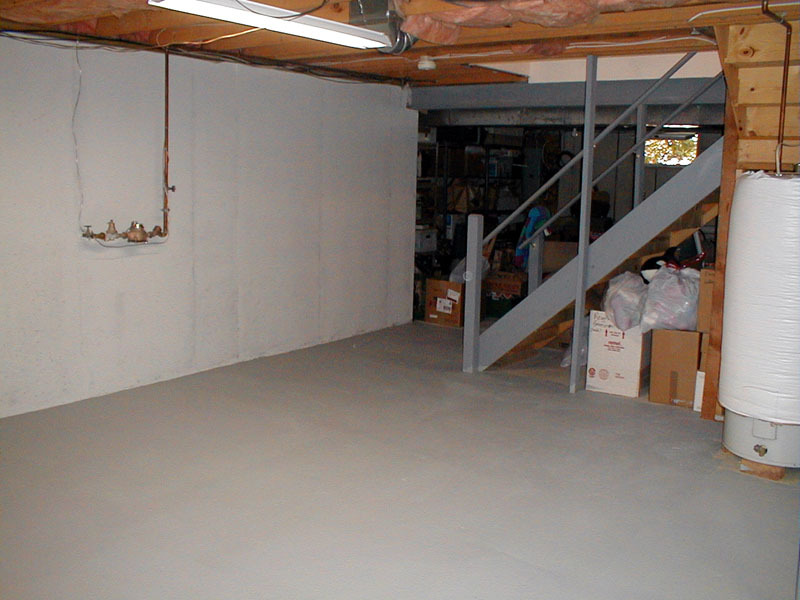 The corner for the room has been cleaned sealed and painted. 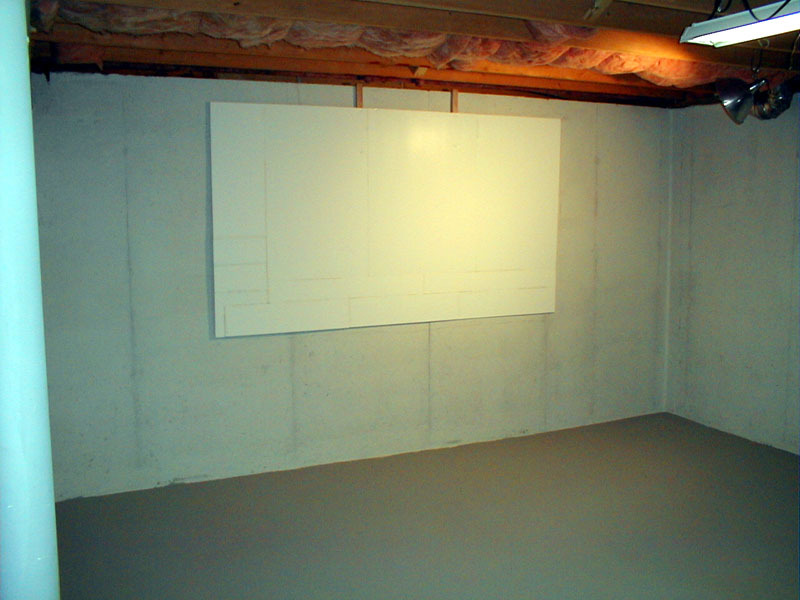 A mockup 106" diagnal screen is mounted on the wall to work out some final sizing details. Shot looking towards the rear of the theater towards the basement stairs. 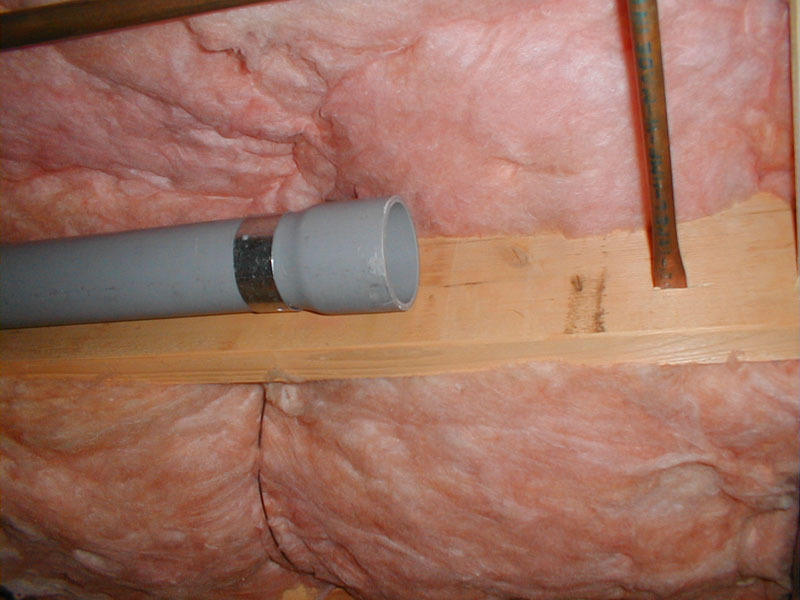 Note that the water heater in the view will be relocated out of the theater room. 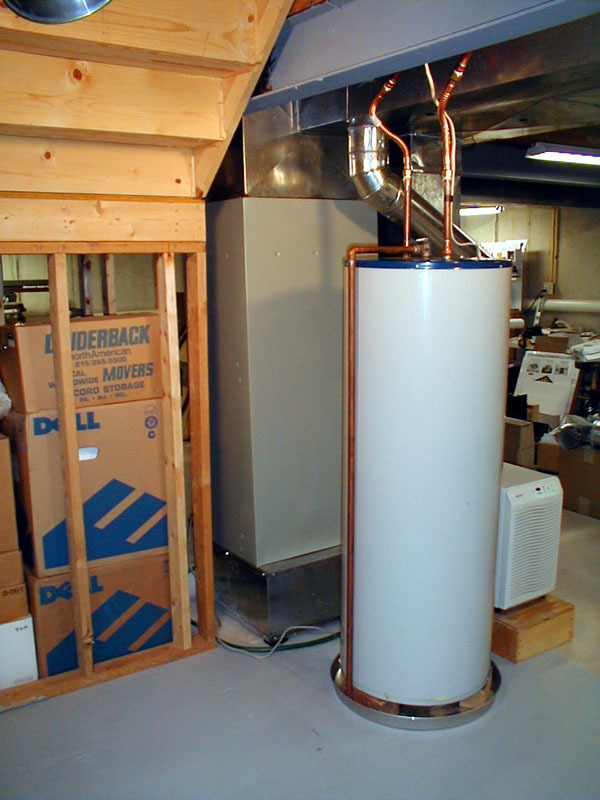 The water heater in its new location on the other side of the support beam and out of the theater room. 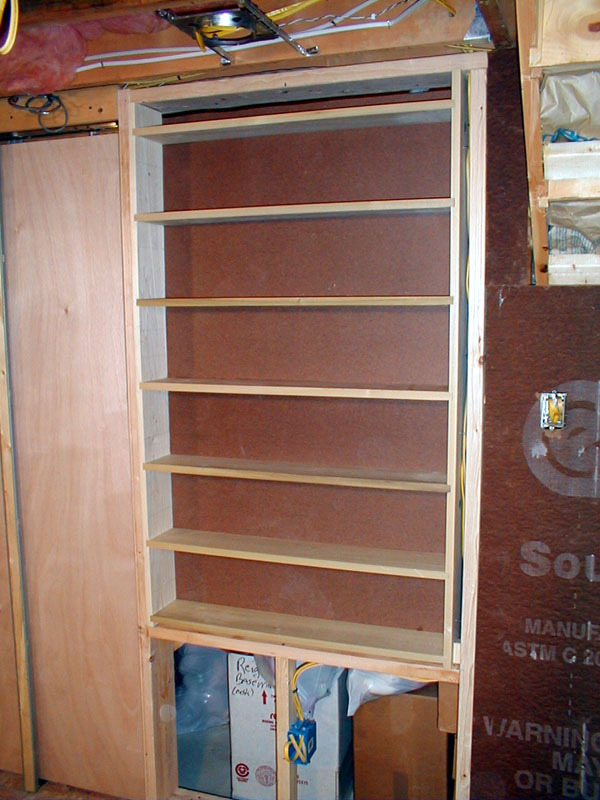 The DVD shelf unit has been completed and mounted in the opening in the back wall. 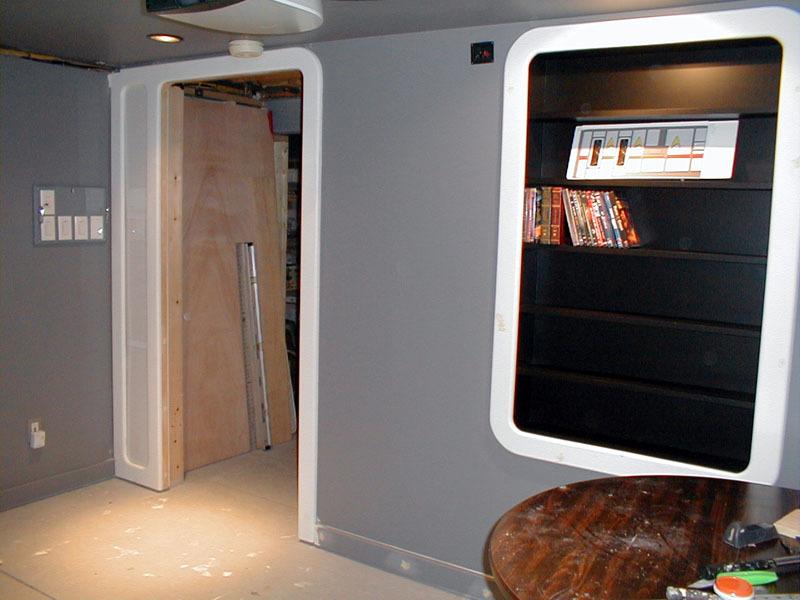 Here the DVD shelf trim has been installed. 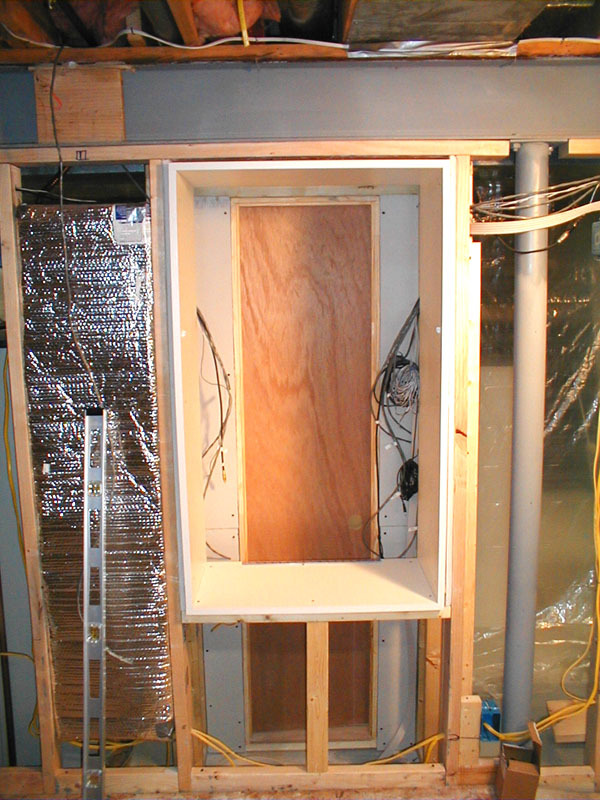 I finally took some time to build the box to conceal the water meeting and associated plumbing. 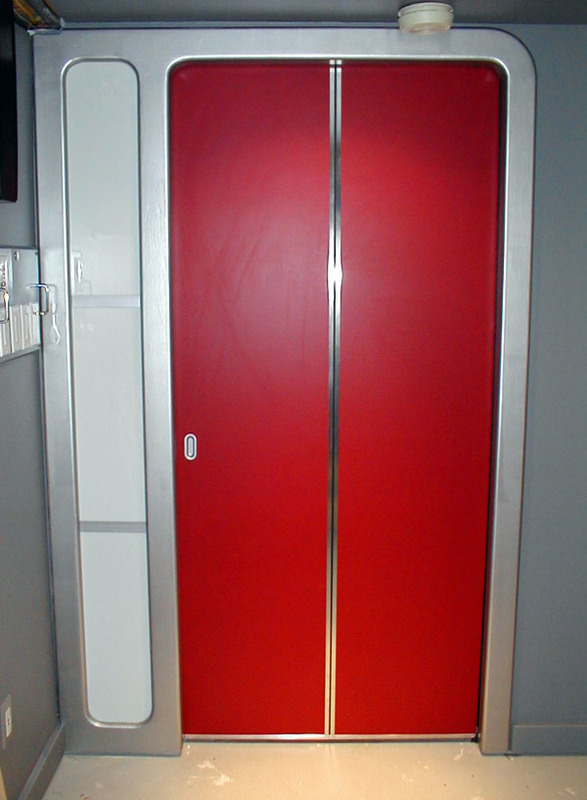 There will be a door on the front and by the upper valve for easy access to the equipment. The water meter enclosure is now completed. 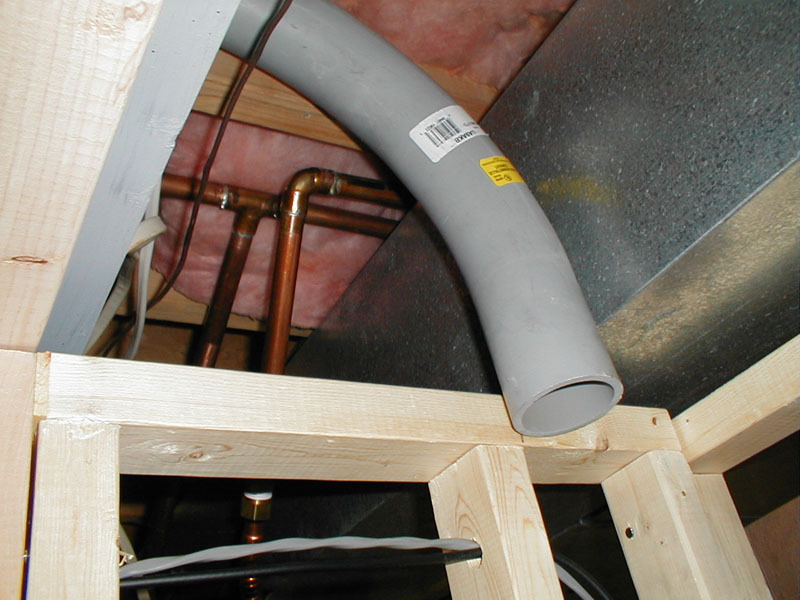 The small piece to the right is the "hatch" for the valve on the right side of the column. The water meter cover is finished. 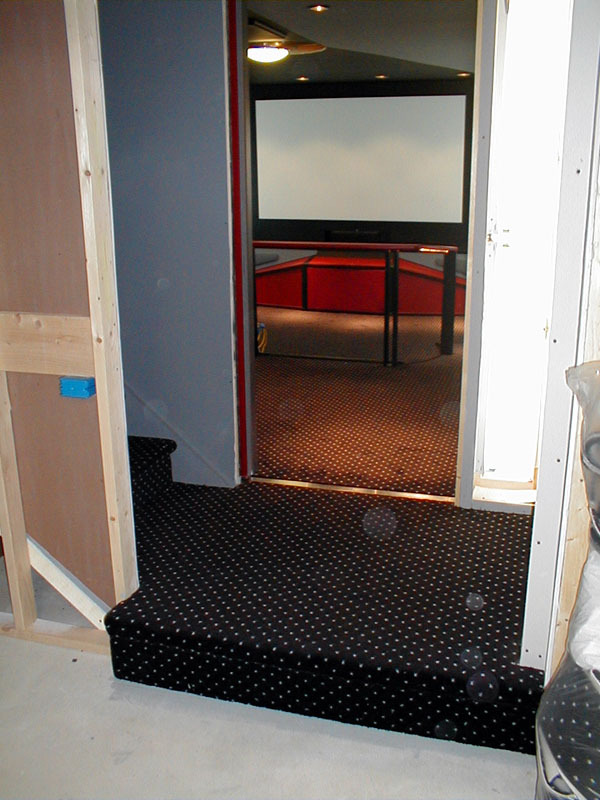 The equipment closet was built as a separate room off the one side of the theater. 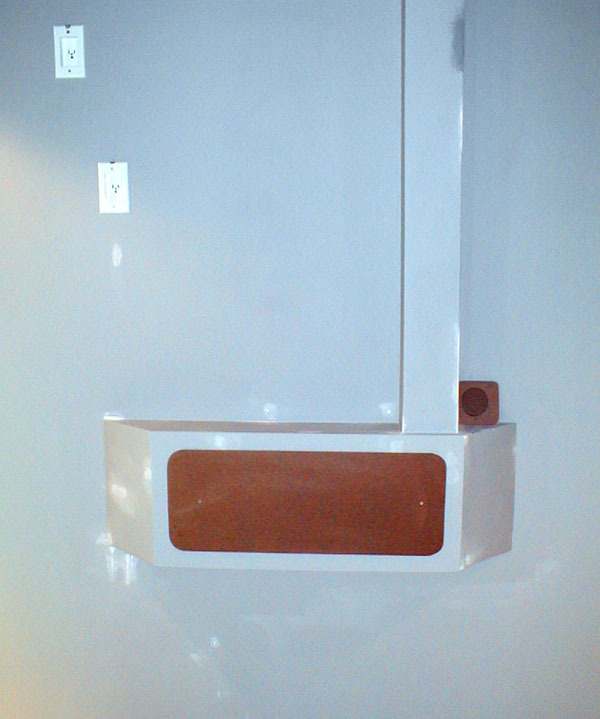 Standard shelves will be used to hold the equipment. 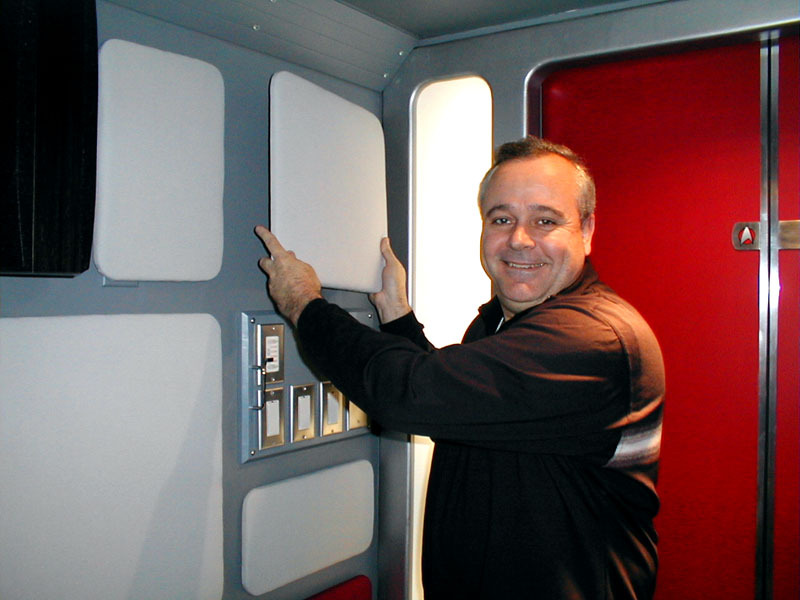 Installation of the Sound Stop board has started. 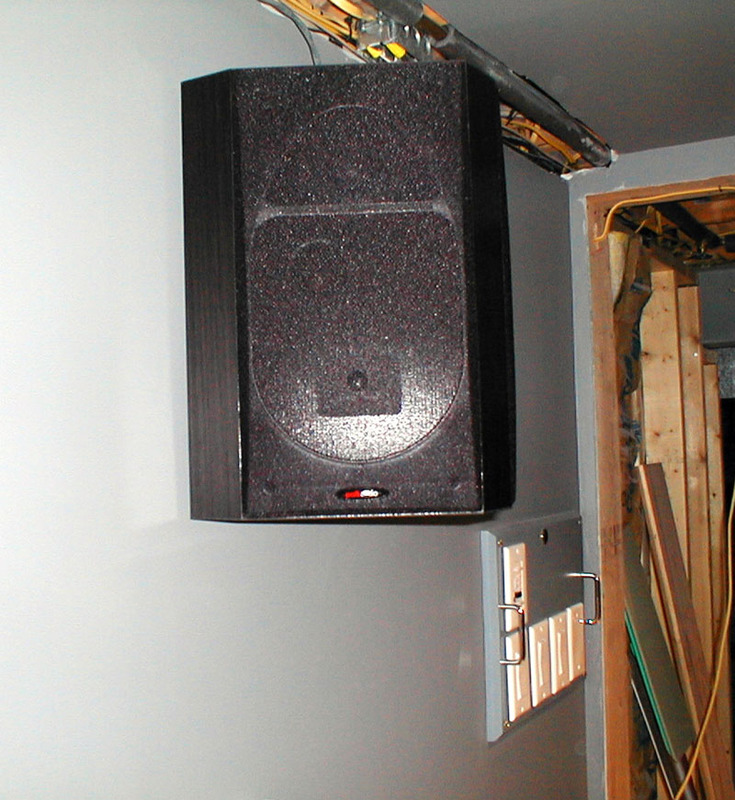 This will reduce sound transmission to-from the other side of the basement and also bring the wall flush with the steel beam overhead to ease installation of the drywall. 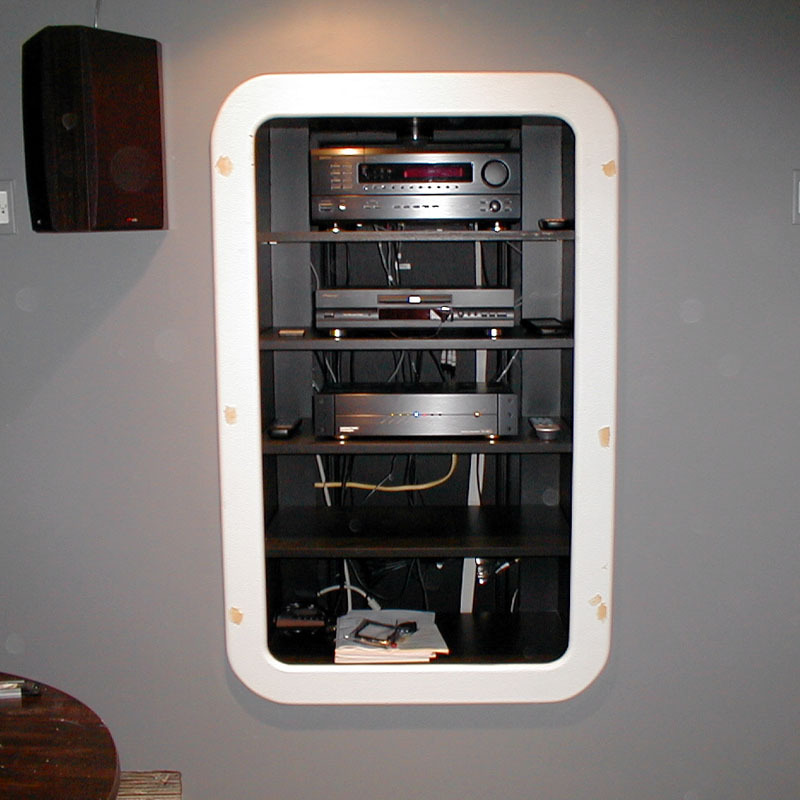 The moulding is installed around the stereo shelves. It will eventually be painted a brushed silver. 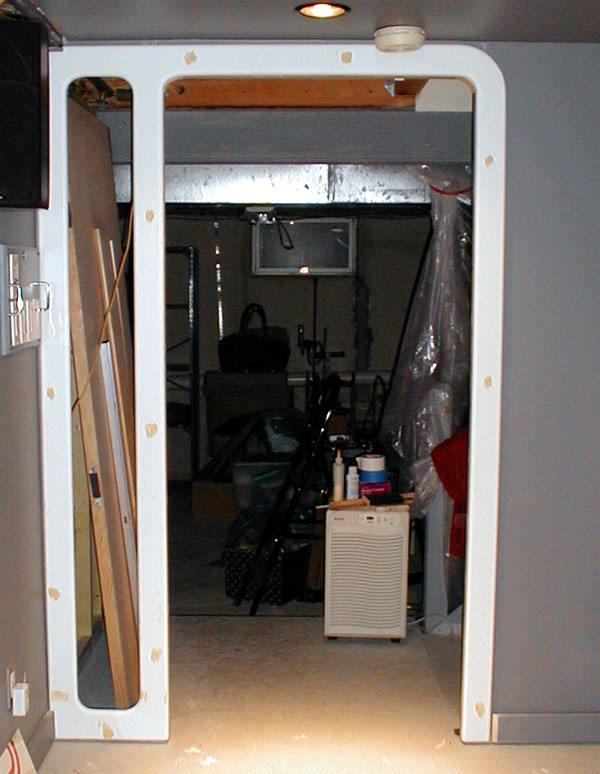 The "pocket" door has been installed on the track and is shown here in the closed position. 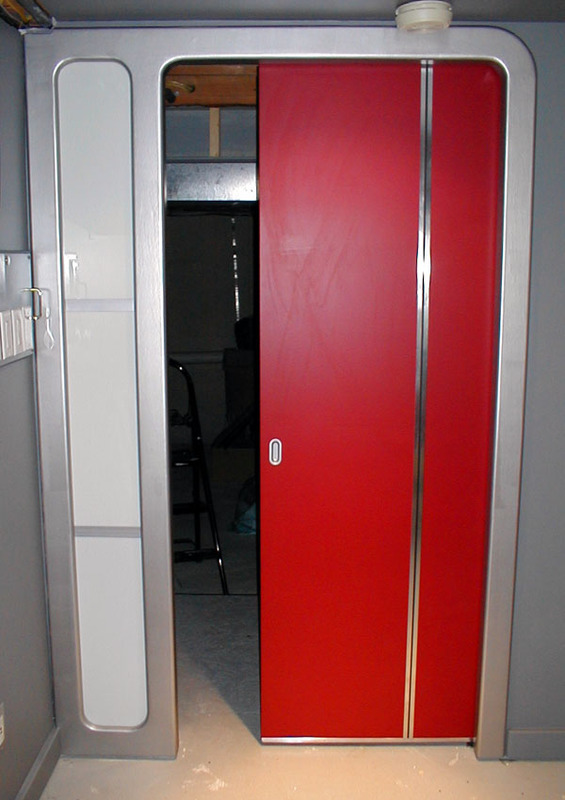 It is a 1 3/4" wide solid exterior laun door. It weighs a ton (well, not really). It should provide a nice solid and soundproof barrier. 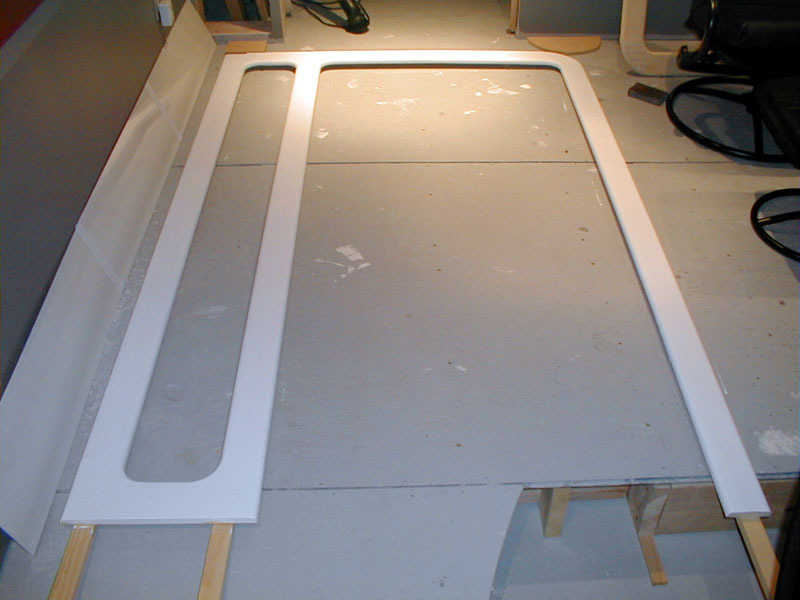 Here the door moulding is shown primed and ready for installation. 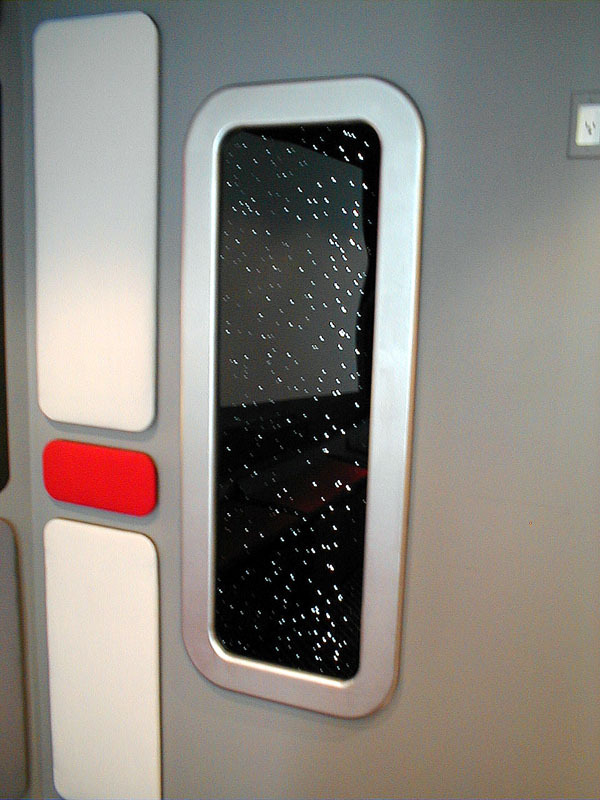 The slot to the left of the door will contain a back lit opaque plexiglas insert. 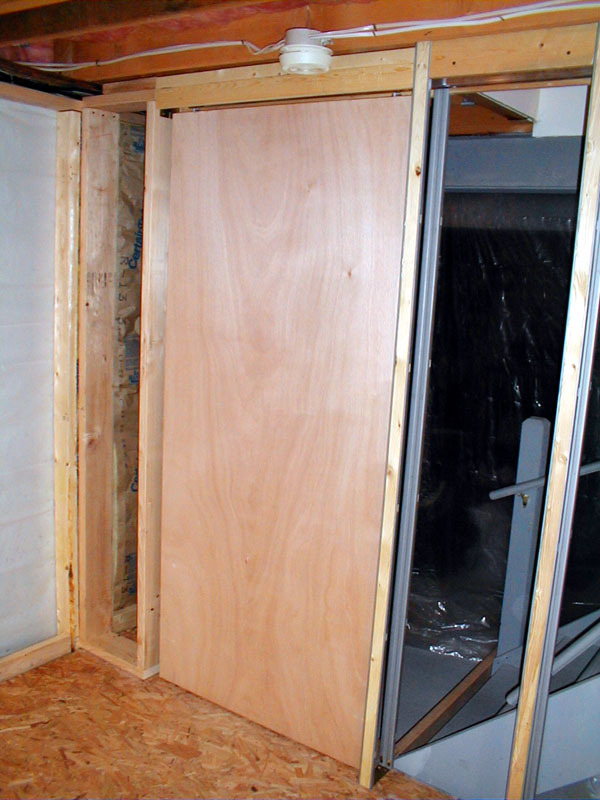 Here the door moulding has been installed. 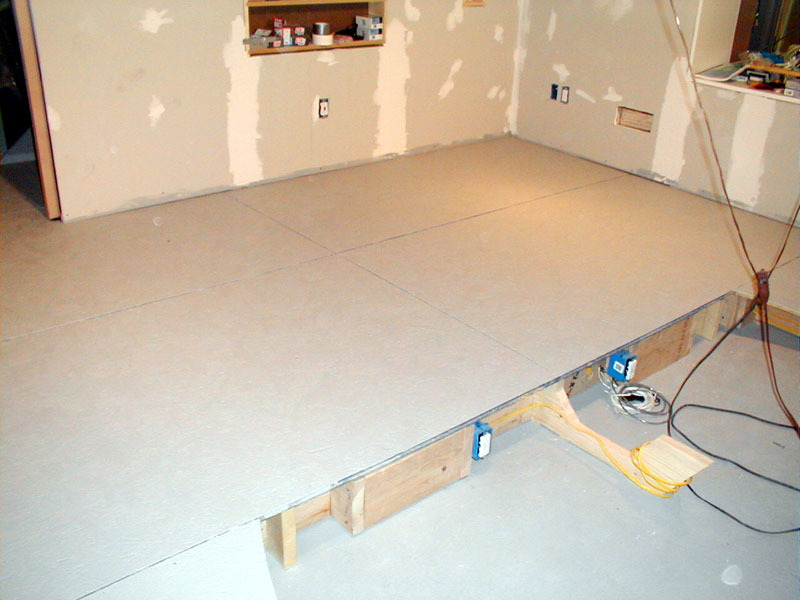 The rasied floor fo rthe second row seats is shown here. 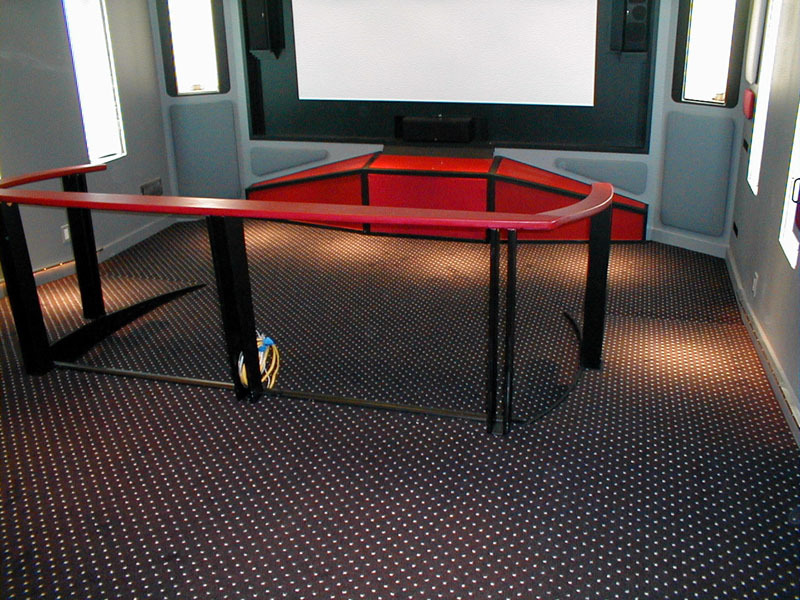 This tube serves as the conduit for the audio/video cables that will run to the projector. 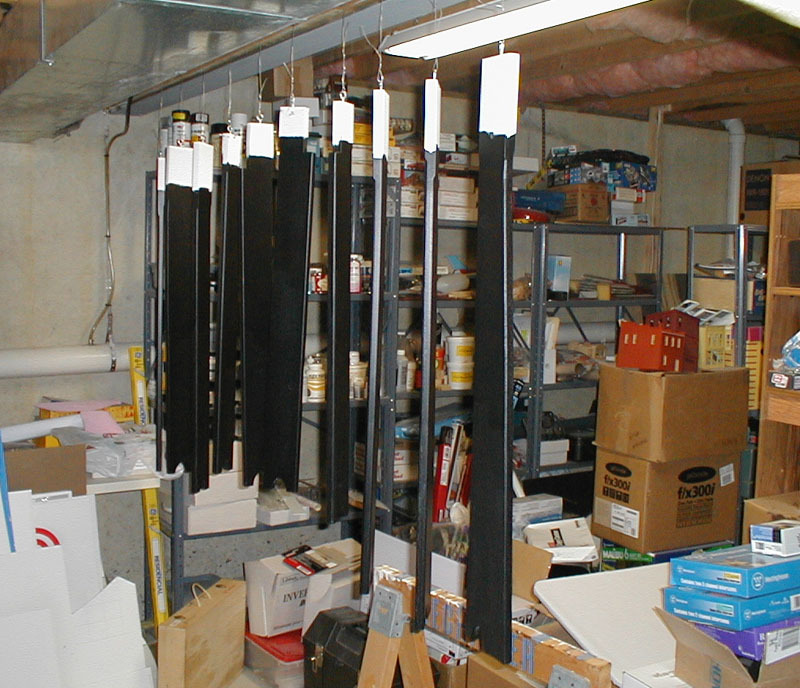 This shot shows where the tube ends at the top of the equipment closet. 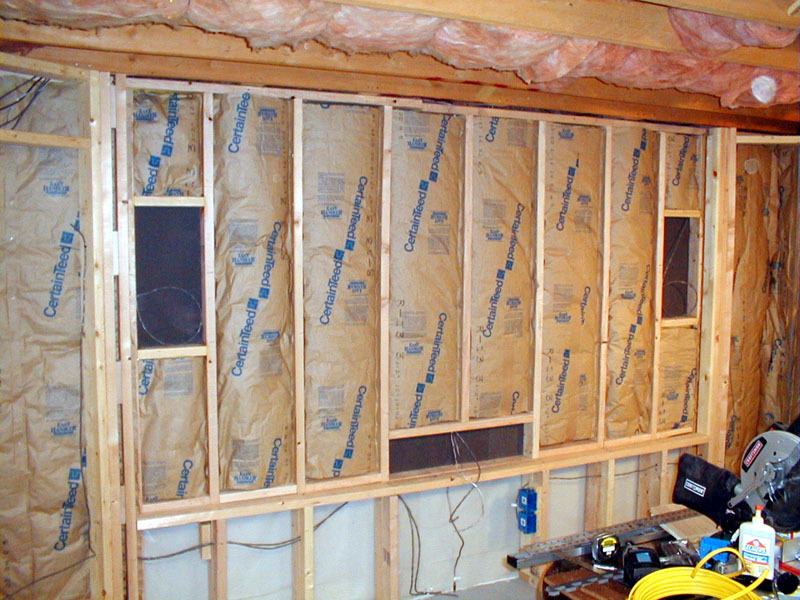 In this shot the screen wall has been insulated and is ready to be covered. 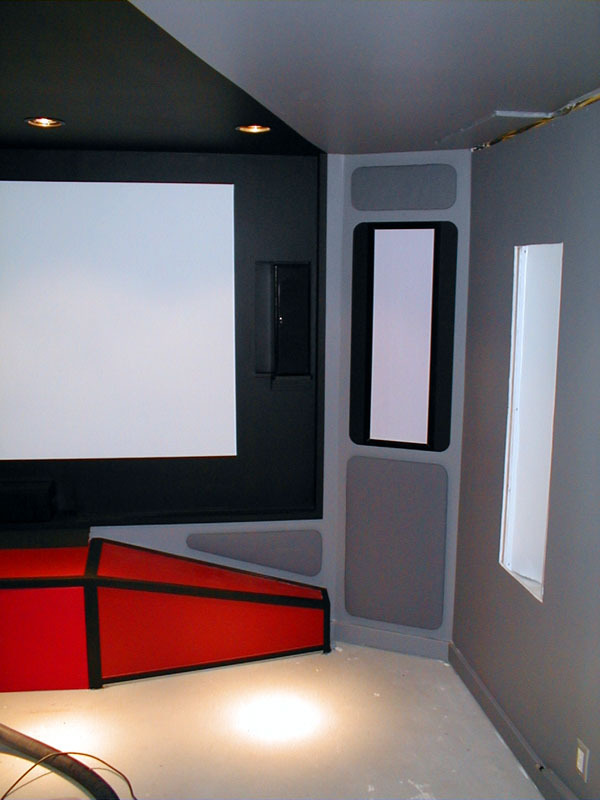 The dark areas are for the three front speakers. 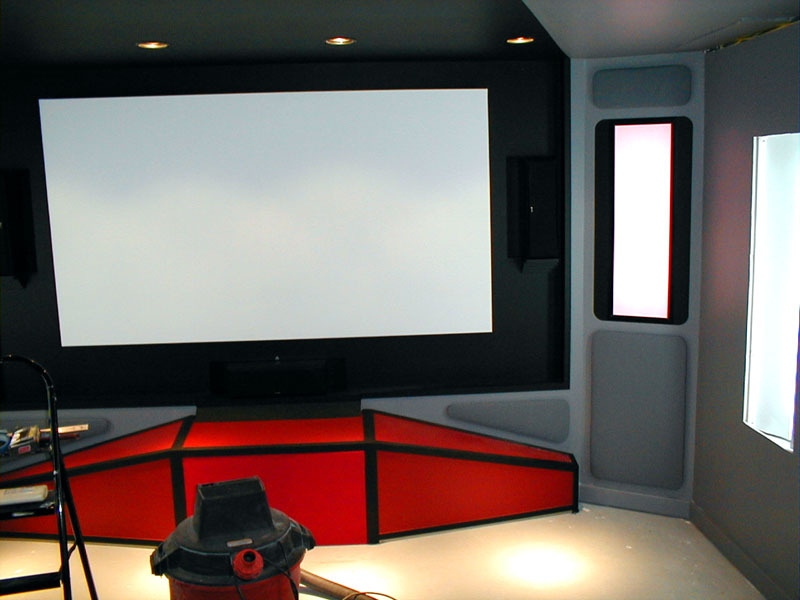 The proscenium which will house the front subwoofer has been built and is awaiting finish painting. 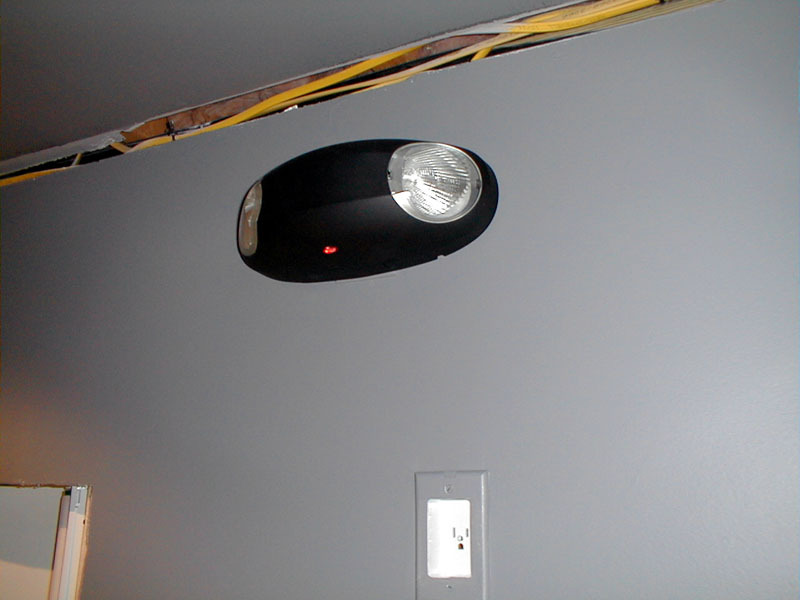 The black on the ceiling has been completed. All ceiling lights have been installed. 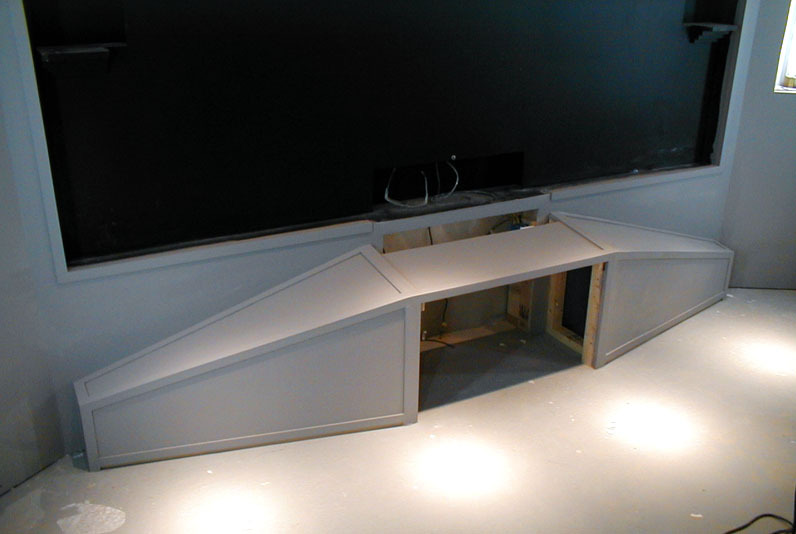 The framing for the computer displays is completed along with the addition of several of the sound absorbing panels. Another shot of the front wall. Construction of the Bridge railing has begun. 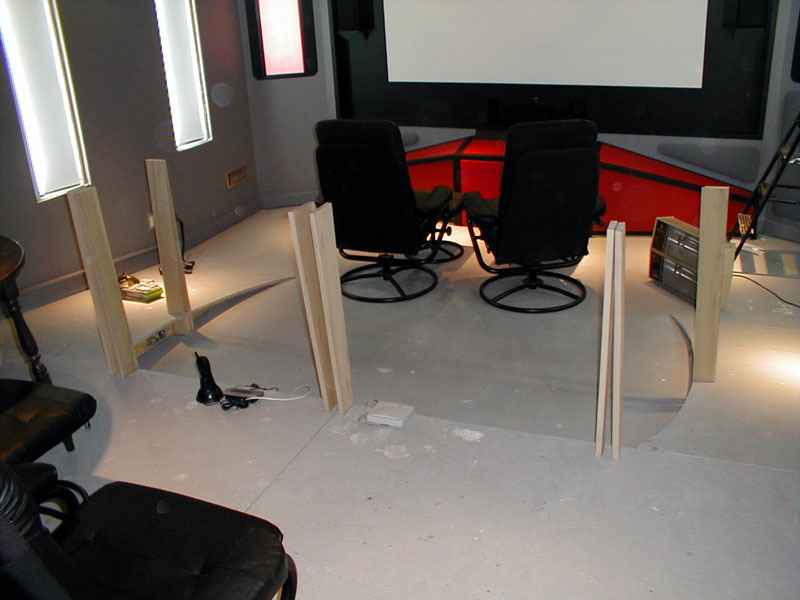 The uprights have been cut and shaped but are not yet mounted. Another shot of the railing being built. 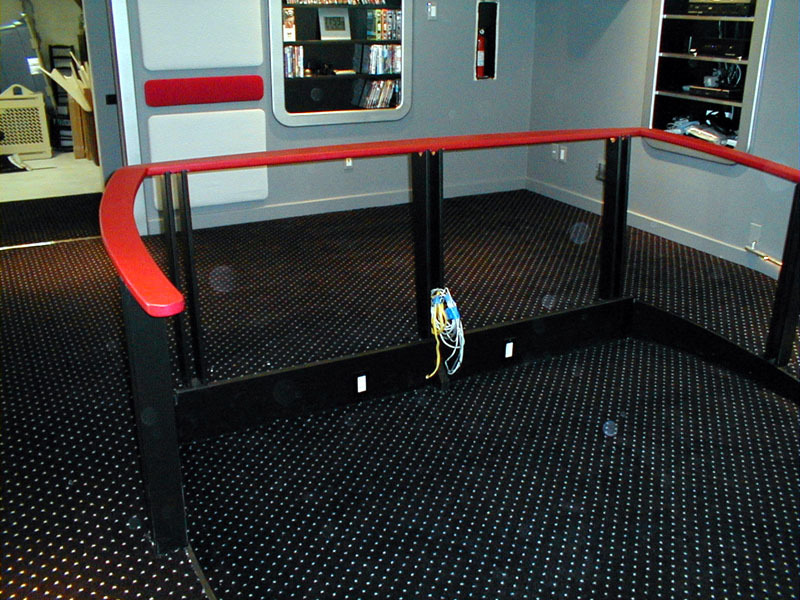 The railing has been attached to the stanchions. 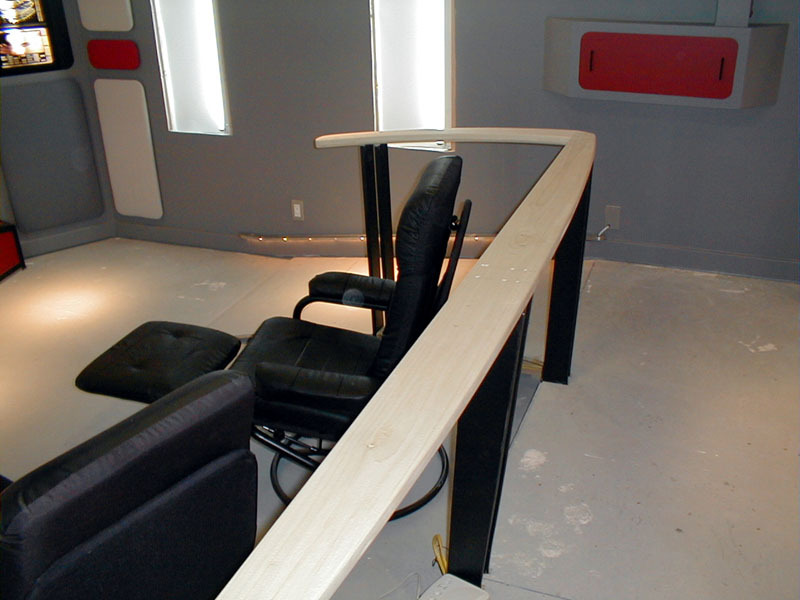 Another shot of the railing under assembly. 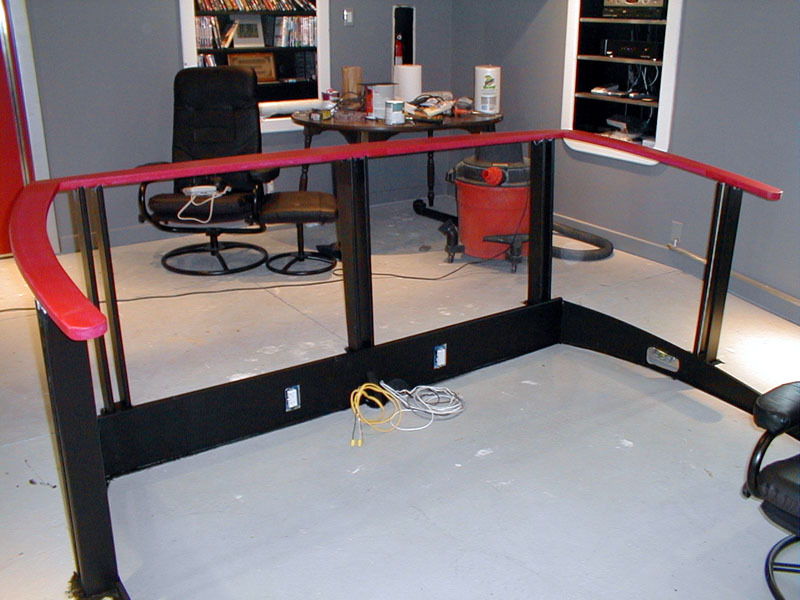 The railing has been painted red and the inside of the riser has been finished and painted black. 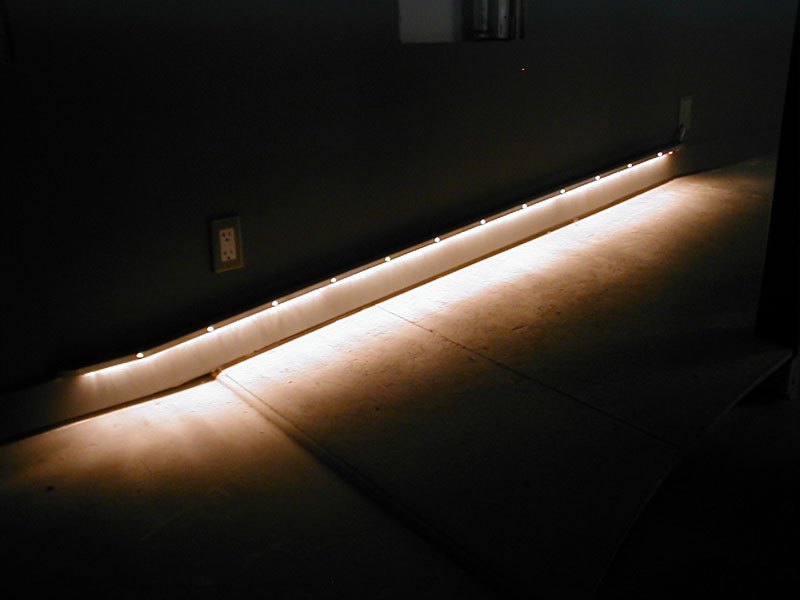 The rope lighting illuminating the ramp has been installed. 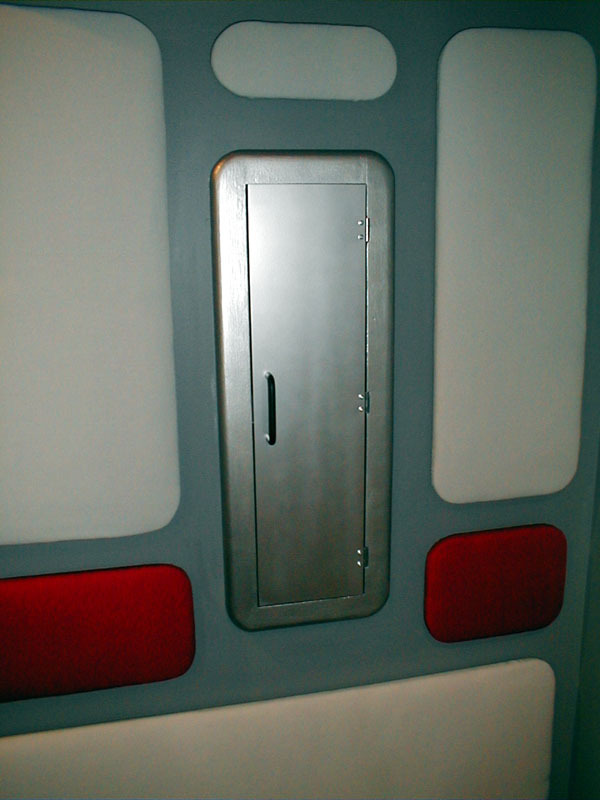 The door has been painted and mostly detailed. A few more trim pieces need to get put on. 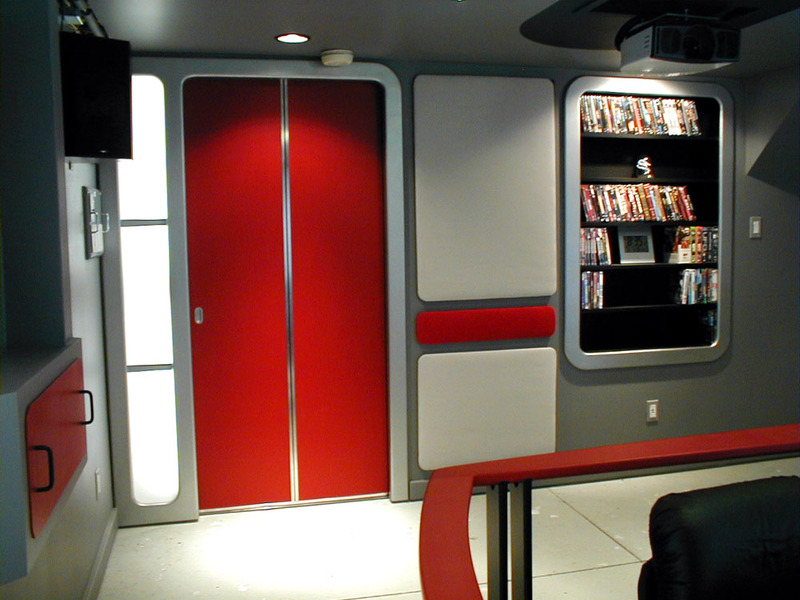 Another shot of the door partially open. 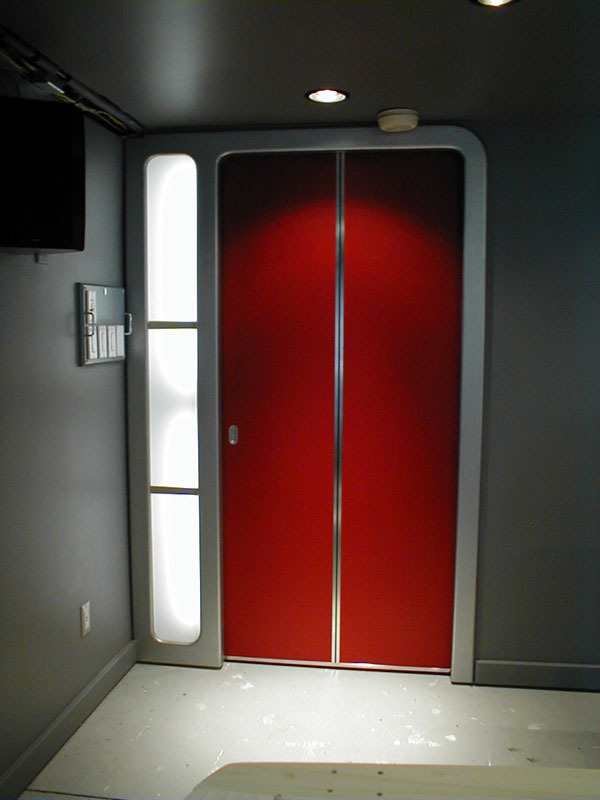 The lighting to the side of the door has been installed. 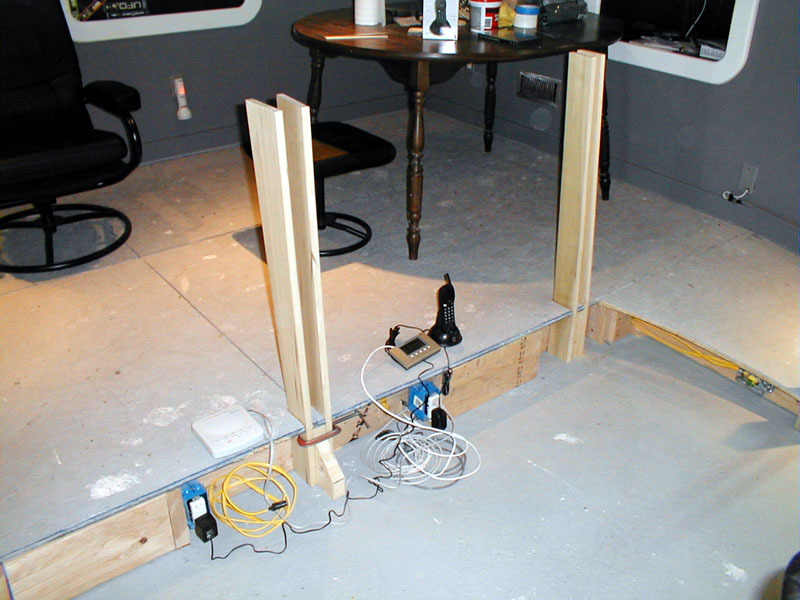 An emergency lighting system has been installed. 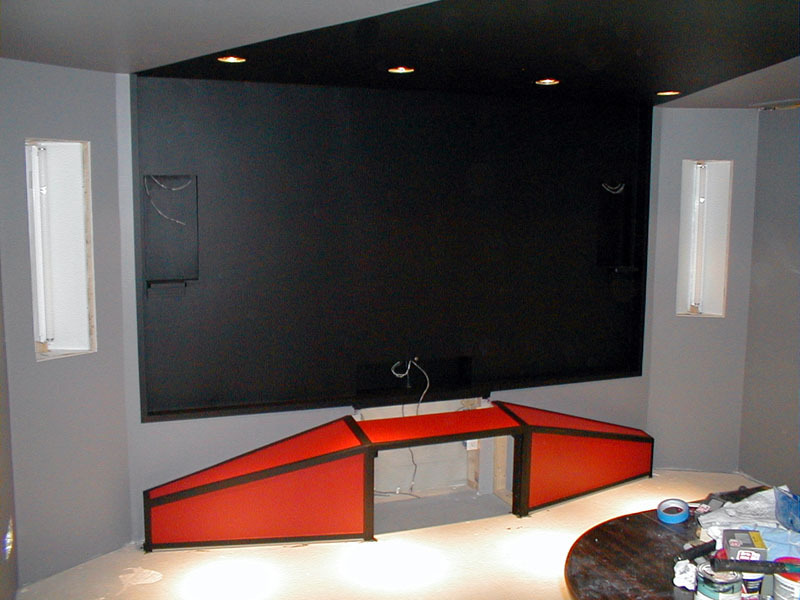 The rear surround speakers have been installed. 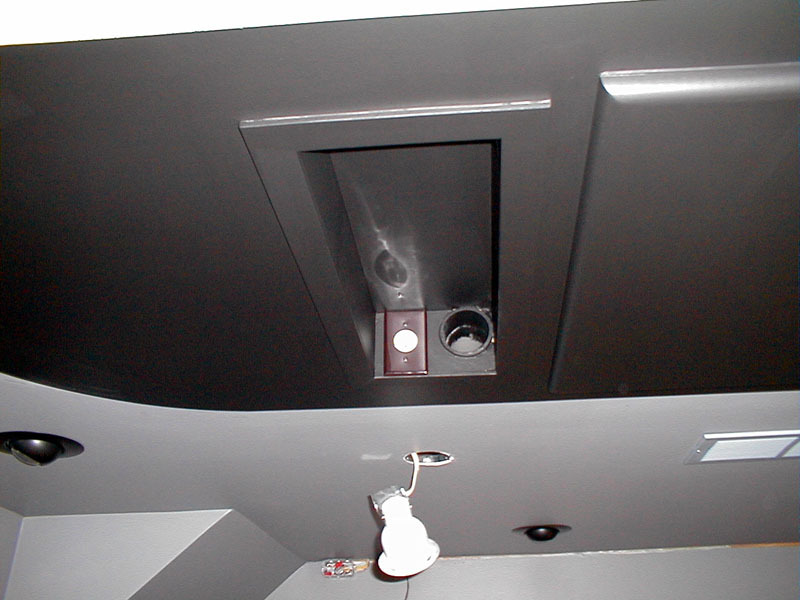 The projector mounting box with power outlet has been installed and painted black. The projector finally arrived on 11/25! 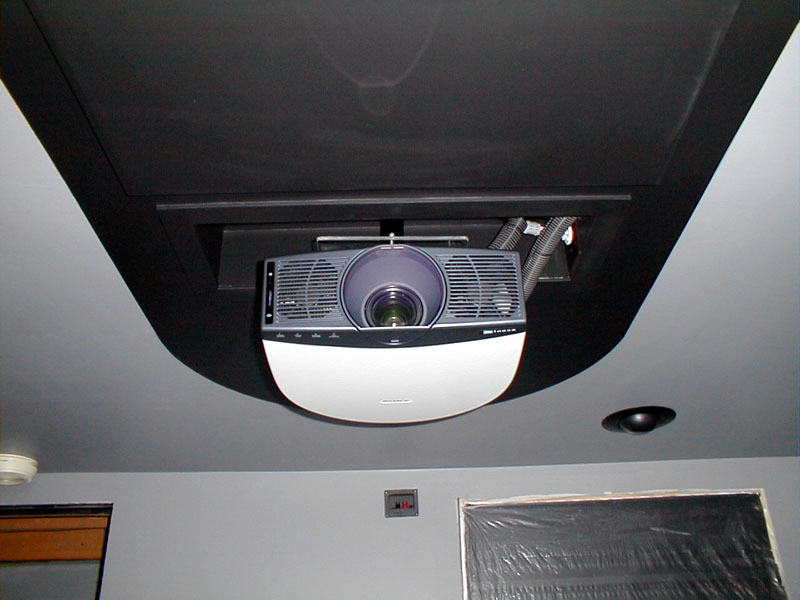 It is the Sony Cineza VPL-HS20 LCD projector. 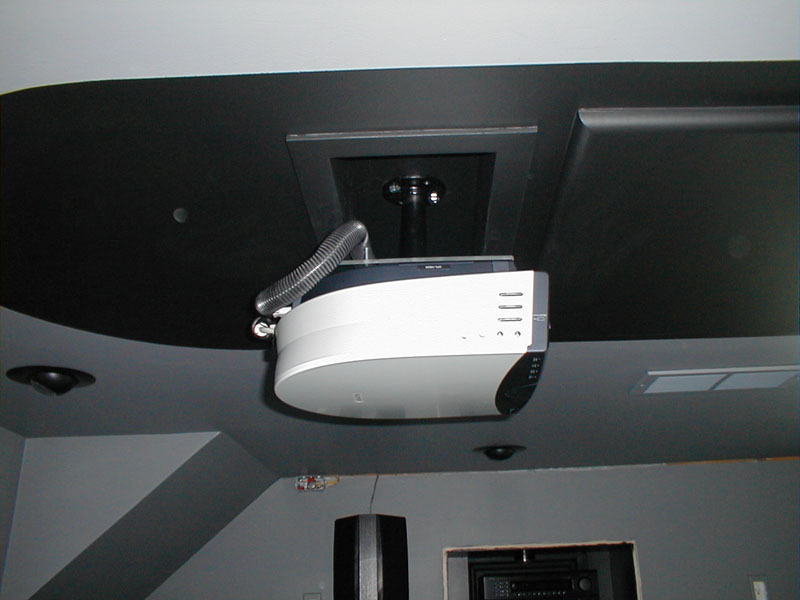 Another shot of the projector and DIY mount. 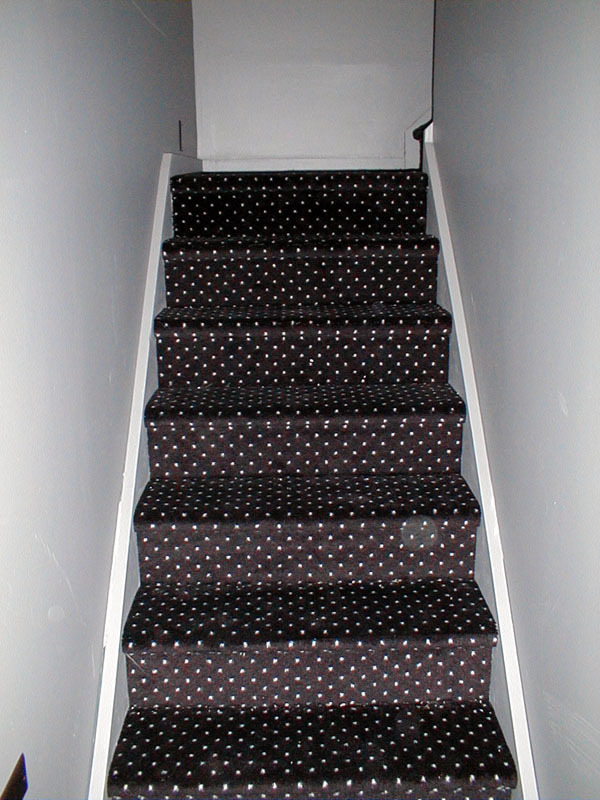 Carpet samples under consideration. We have decided to go with the middle sample which is black with white spots. 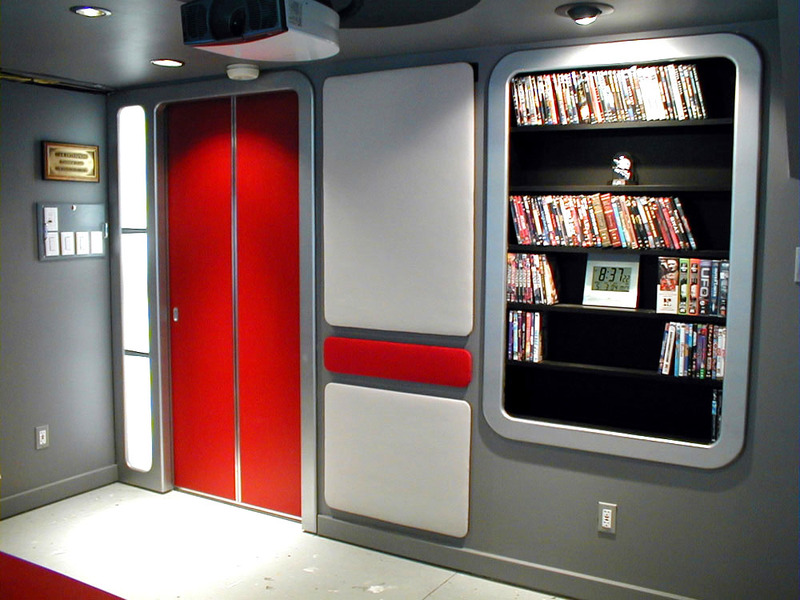 Curiously enough, the carpet pattern is called Stargate! 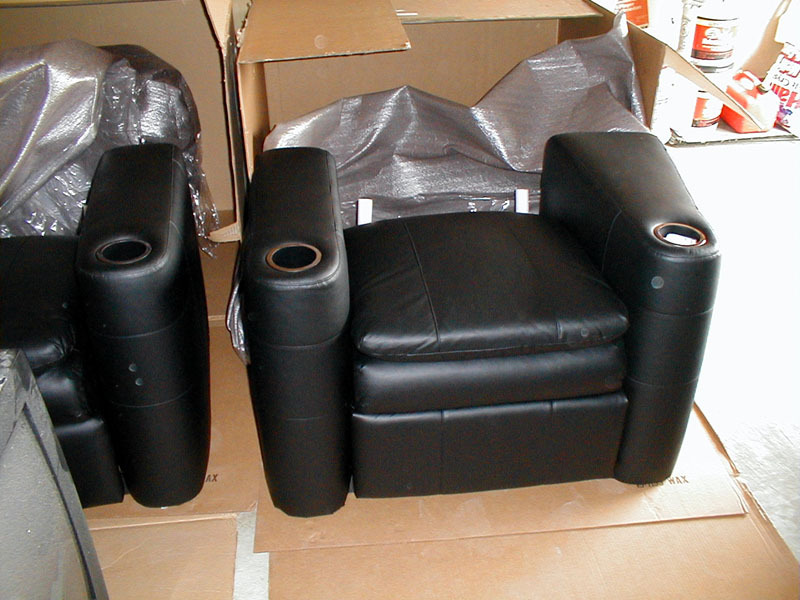 My pair of Berklines 099's arrived for the front row, shown here in the garage without the backs in place. The back wall is nearly finished. 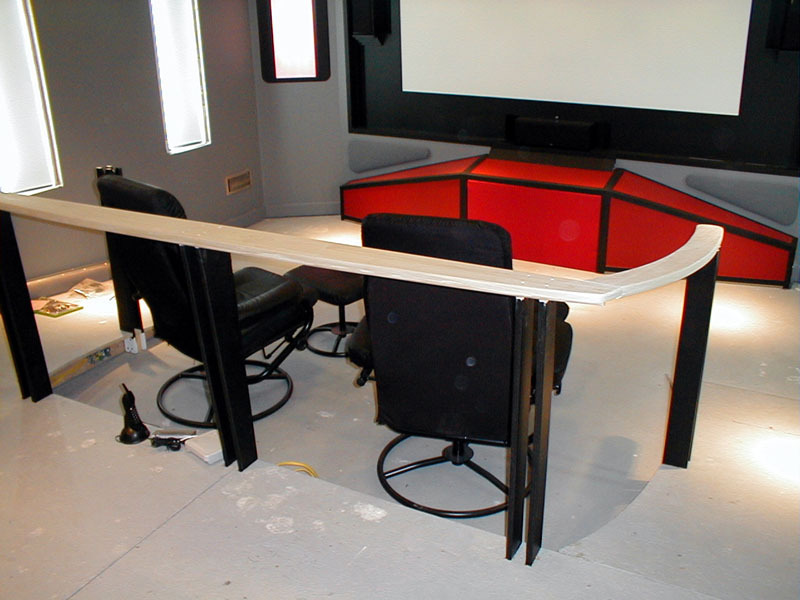 Only the addition of a couple more fabric panels to go. 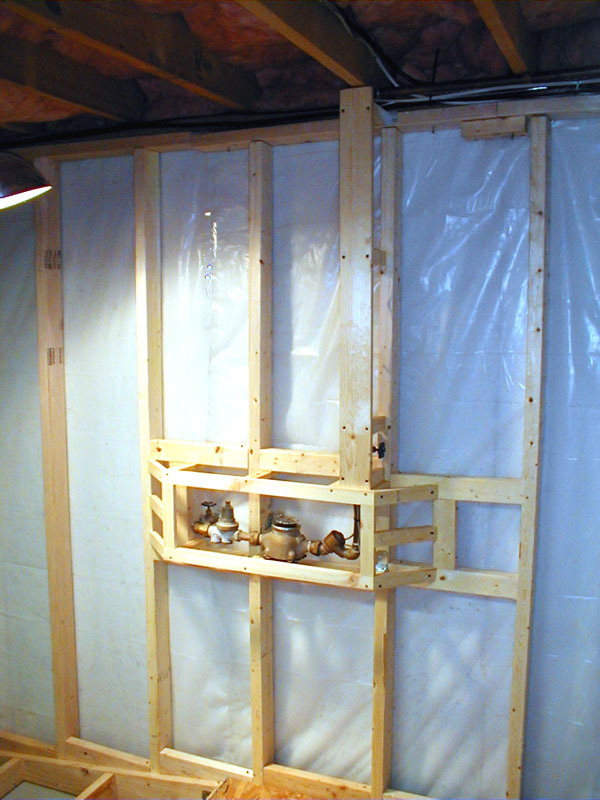 Another view of the back wall from the opposite angle. 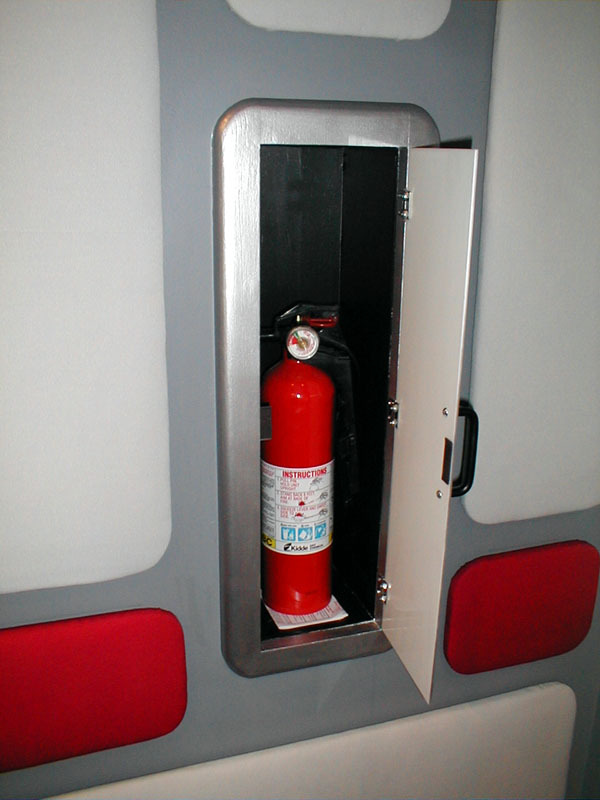 The fire extinguisher cabinet on the rear wall has been completed. Here the door is open. The lower part of the stairs leading to the theater. 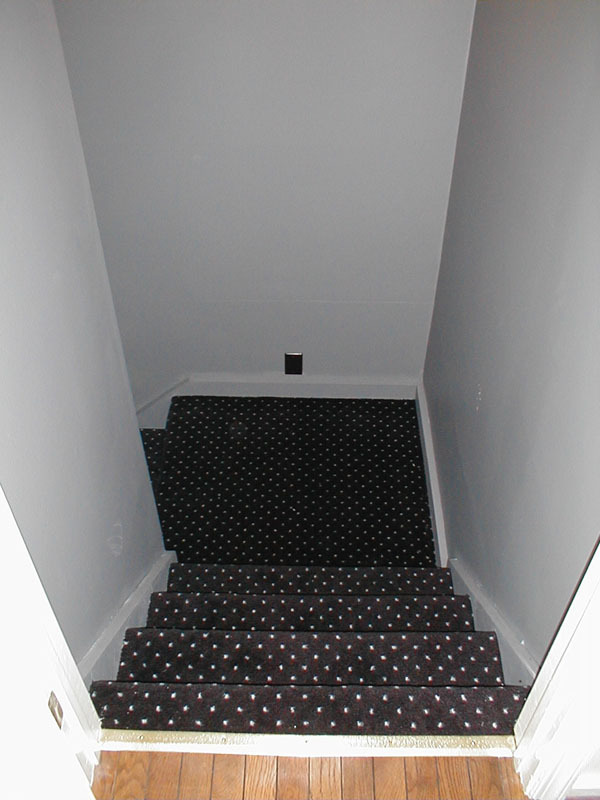 The landing at the bottom of the stairs. The moulding around the door and light have yet to be installed. Looking into the theater from the doorway. This shot is from the front of the theater. This is a test install of the first "viewport" window. 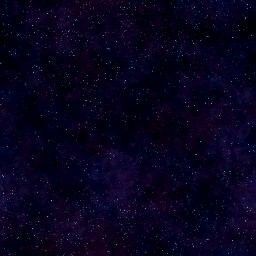 The streaking effect of the stars is caused by camera movement. For lighting control, I selected using an X10-based system from Smarthome.com. 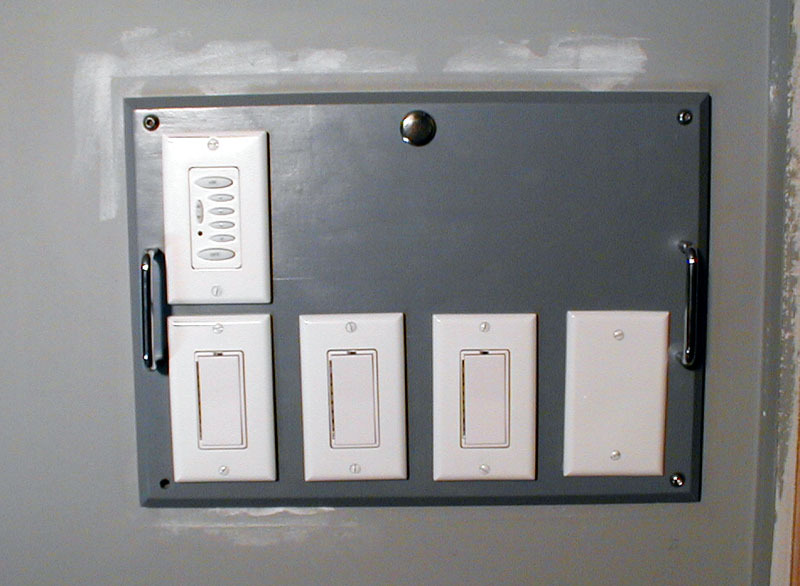 Here, four of the X10 dimmers, switches and control units have been installed. 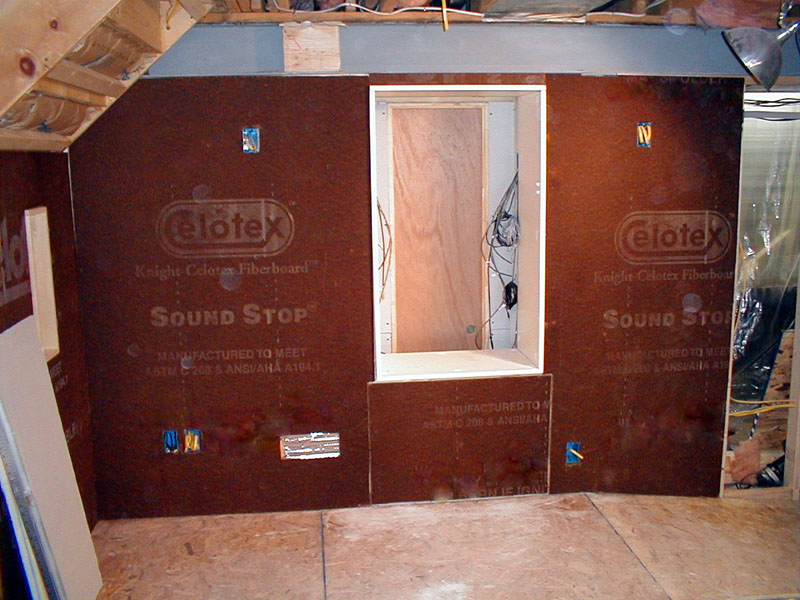 The last of the 56 acoustic wall panels is put in place Jan 23, 2005. 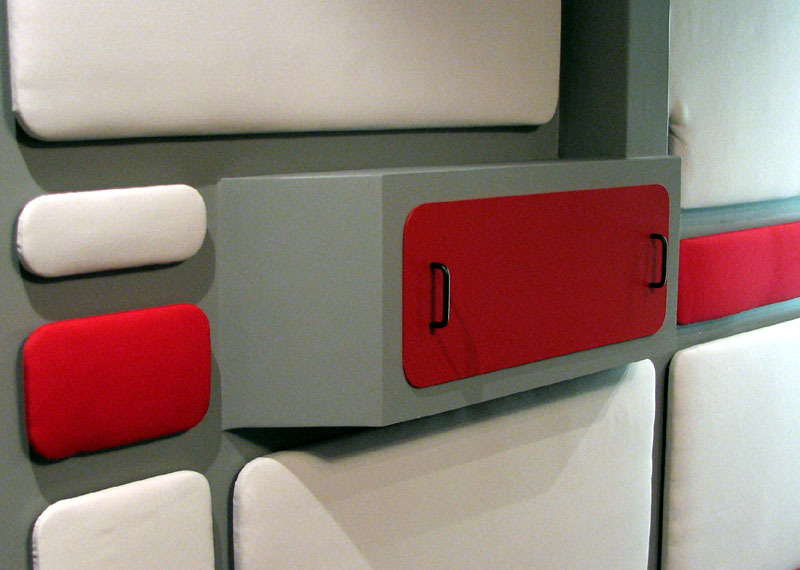 The panels are covered in a fire rated Dazian PD cloth. 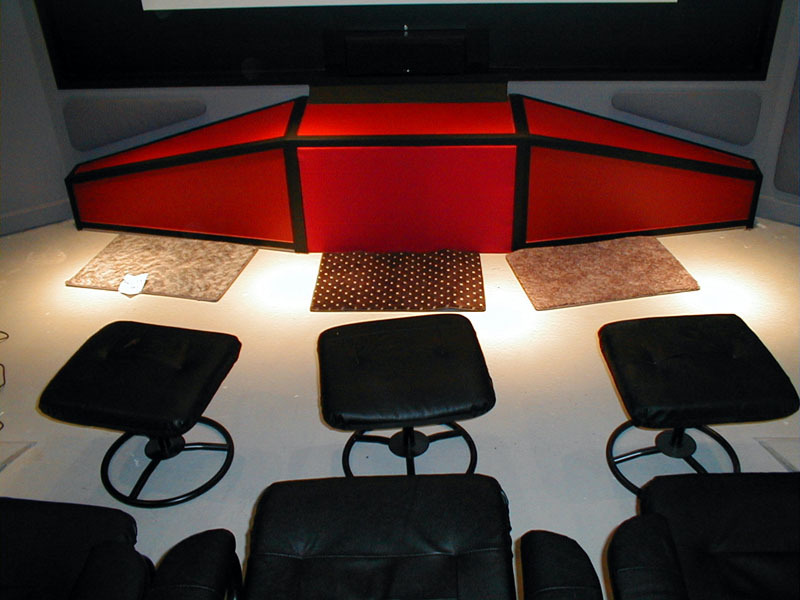 For details on some of the do-it-yourself projects for the theater, go to the DIY Projects page.